How far will I go to be the best cat parent I can be? Pretty far. This desire was the inspiration behind the world’s newest (and strangest) cat grooming invention: The LICKI Brush. According to their website, “Licking your cat with LICKI is an oddly meditative practice, soothing for both you and your cat.” Sounds weird but promising. Its creators, Jason and Tara O’Mara, are the co-founders of PDX Pet Design, out of Portland, OR. A video of their feline-in-mind invention, the LICKI Brush, was leaked onto Reddit just a few days ago, and meowbox was the first to share it with the cat world. For lack of a better phrase, it’s now gone viral. I asked Tara what prompted the creation of this unusual device. In the words of a true cat-loving entrepreneur she admitted, “…we were looking for the next big thing that would shake up the kitty-sphere. Grooming seemed obvious to us. Cats spend so much of their time grooming themselves and other cats and it seemed sad humans can’t groom their kitties back.” This was the first time I realized that reciprocal cat licking was even on the table for consideration. The buzz over Licki Brush has been intensified by some of the world’s biggest digital media outlets and even TV network ABC’s Kelly Live is wanting in on the action. They have requested that the one and only existing Licki Brush prototype be shipped to their studio! 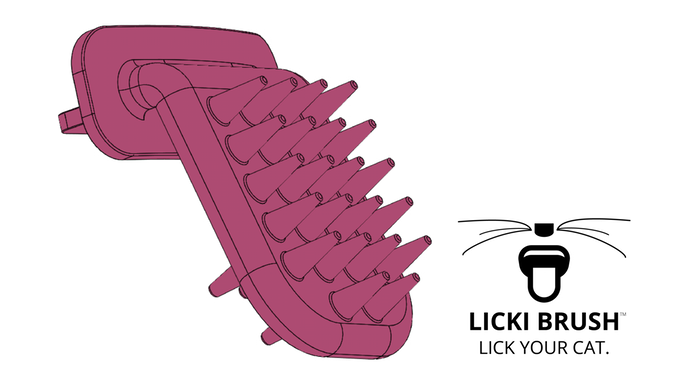 Lucky for us mere mortals, the Licki Brush Kickstarter campaign launched late last night. The initial tier offering of one brush for $15 has already completely sold out, but the $19 option was still available last time I checked. It’s tough to determine whether folks are buying these as a gag gift or as a way to get in their cats’ good books. The O’Mara’s are no rookies when it comes to how to run a successful Kickstarter campaign. In 2013, they created an intelligent electronic cat toy called Shru, and were able to secure 1000% of their desired funding. I have no doubt that the Licki Brush campaign will see the same success. My advice is to jump on that train and avoid your cats’ savage death stares. As bizarre as this fur-licking device may seem, just remember, it’s all about the cats.